The extraordinary rise of Podemos, Spain’s eight-month-old protest party, continues. A new Metroscopia poll for El País, released on Sunday, showed that the party would win a Spanish general election, if held today, with 27.7% of votes. The Socialist Party would finish second on 26.2%, followed by Spanish Prime Minister Mariano Rajoy’s Partido Popular on 20.2% – less than half the 44.6% the party won in the November 2011 general election. 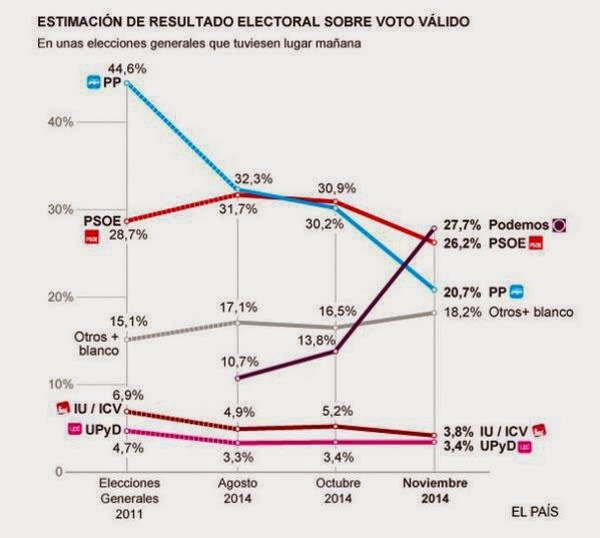 This is unbelievable stuff, but what lies behind the instant success of Podemos? New media: Can establish and multiply protest movements in a heart beat. Italy’s Five Star Movement is a well-know example. Podemos, too, has fed off this. Corruption scandals: There have been a series of pretty big ones in Spain over the past two years (see this blog post we wrote last year, for instance). That said, though, Spanish politics have struggled with flaky politicians for some time, so this in itself doesn’t answer the ‘Why now?’ question. Loss of trust in mainstream parties: This is the same story as virtually everywhere in Europe. In the Metroscopia poll we mentioned above, 42% of respondents said they were inclined to vote for Podemos because of “a feeling of disappointment and disillusionment with the other parties”. “They’re all the same”: Related to the above, and especially during the post-crisis years, many Spanish voters don’t see much difference between Partido Popular and the Socialist Party. Again, though, Spain has been a two-party, ‘centripetal’ system for quite some time, so why is it that voters turn against mainstream politicians now? EU-mandated austerity: This is a big part of the story, which reinforces the above point. Partido Popular and the Socialist Party are broadly seen by the Spanish electorate as implementing the same set of austerity policies. Remember, the first substantial austerity package during the Eurozone crisis in Spain was passed by the Socialist government of José Luis Rodríguez Zapatero in May 2010. Podemos certainly doesn’t describe itself as ‘eurosceptic’, and it’s not ‘eurosceptic’ in the northern European sense. Both the party and the Spanish public as a whole remain committed to the Euro. According to the European Commission’s latest Eurobarometer survey, 56% of Spaniards think the Euro is “a good thing” for their country – up from 53% last year – compared to 34% who think it is “a bad thing”. But just as with SYRIZA in Greece, a big part of the Podemos package is predicated on opposition to policies which are, in one way or another, driven by Spain’s Eurozone membership – most importantly fiscal consolidation and internal devaluation. In other words, Podemos could be described as a ‘shadow eurosceptic’ party. Per implication, this means envisaging a Euro without the Maastricht criteria. Similarly, some of the main policy proposals of Podemos seem to be outright incompatible with Eurozone membership. For example, the party’s flagship proposal is a “basic income for each and every citizen, for the mere fact of being citizens”. According to the party’s own estimates, the measure would cost the Spanish government €145 billion – roughly 14.5% of Spanish GDP. That would bust every EU budget rule on the books. Other proposals, such as more “democratic and parliamentary control” over the ECB, won’t happen as long as Germany is around. Therefore, to a certain extent, Podemos offers voters a ‘false choice’: Euro membership with far-left spending policies. 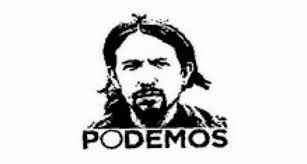 Interestingly, the firebrand anti-austerity talk of Podemos is already having a knock-on effect. Under the leadership of Pedro Sánchez, the Socialist Party has also stepped up its anti-austerity rhetoric. We will see if this will have an impact on upcoming opinion polls. The rise of Podemos shows just how real that risk still is.